From On The Waterfront, 1954. Any idea is a good idea, except the not happy ones. Those we push down deep inside where you never, ever, ever, ever EVER find them! 1. "They say there's just enough religion in the world to make men hate one another, but not enough to make them love." - Louis Cyphre, "Angel Heart"
2. "It was Keyser Soze, Agent Kujan; I mean, the Devil himself. How do you shoot the Devil in the back? What if you miss?" - Roger "Verbal" Kint, "The Usual Suspects"
3. "Look, we're not worried about the German Army, we've got enough troubles of our own. To the right, General Patton. To the left, the British Army. To the rear, our own goddamn artillery. And, on top of all that, it's raining. And the only good thing to say about the weather is that it keeps our Air Corps from blowing us all to hell because it's too lousy to fly! Verstehen?!?" - Big Joe, "Kelly's Heroes"
"My mother told me, 'In this life, Elwood,' she always called me Elwood; 'in this life you must be oh, so smart or oh, so pleasant.' Well, for years I was smart. I recommend pleasant. You may quote me." - Elwood P. Dowd (Jimmy Stewart) in Harvey. 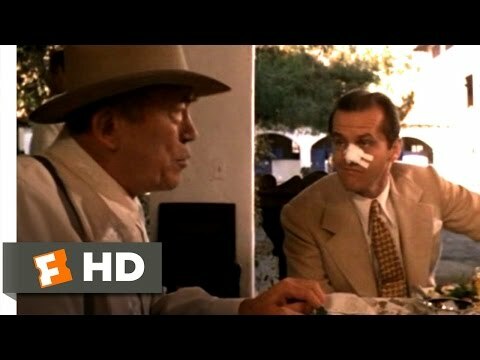 Nicolas Cage, who has the unique ability to flip the emotional switch at a moment's notice, in "Honeymoon in Vegas" shouts what I was thinking when I saw this scene ... "He lives in a shack!" "D+...Oh my God...I passed! I got a D+! I'm gonna graduate!" What is your favorite line from a movie ?